American Fritz Hoffmann was the first foreign photojournalist working in China to be accredited to live outside Beijing since 1949. 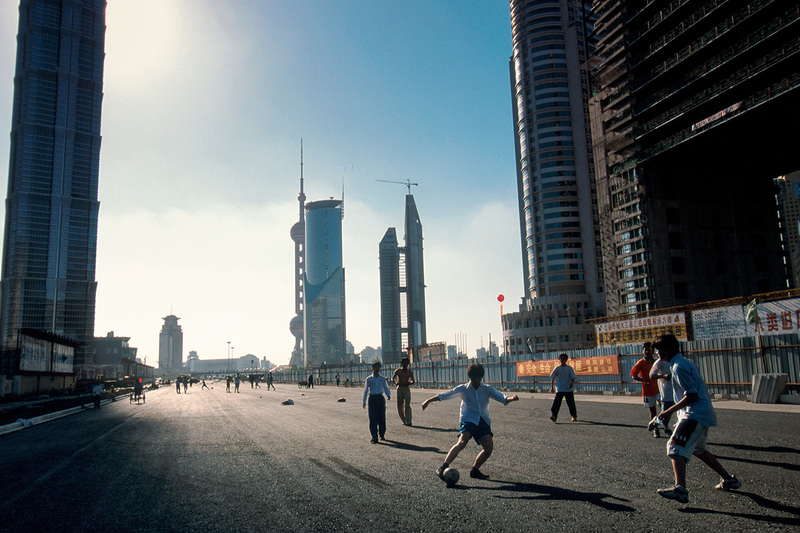 This image, of an after-school football match on the main thoroughfare Century Avenue in Shanghai, was made on assignment for TIME in 1998. This article was first published by Caixin. Hoffmann took the advice, moved to China in 1995, and eventually became the first foreign photojournalist to be accredited to live outside Beijing since 1949. He has gone on to shoot in every Chinese province and municipality for a range of top international publications that include National Geographic, The New York Times, Fortune, Business Week, Helsingin Sanomat, The Independent, and L’ Express. He lived in Shanghai until 2008 and returns regularly from his current base in California. At present, Hoffmann is preparing for his 12th National Geographic project in China. The following are excerpts of Caixin’s interview with Hoffmann. Caixin: What was it like when you first arrived in Shanghai? Hoffmann: I had to navigate the culture, customs, and politics alone. I was trying to get my accreditation and I was constantly hassled for taking pictures. But I loved being there then. It was the time of my life, the sunshine days. What did you do in that initial period? Shanghai was a big construction site, and I’d bike around the Pudong [district] all day taking pictures. I had a goal and a hobby to go up on every skyscraper under construction in Shanghai. I would bike out, knock on the gate, talk my way in, go up, and make some pictures. One day, for example, I got a call from New York—they’re doing a story on migrant workers and needed a photo the next day. So I went to the Jin Mao Tower, talked to the site supervisor in my best Mandarin, told him I was doing a story for Business Week, and he reaches into a drawer and gives me a badge and a hard hat and says, “Be careful.” Just like that! Imagine being in New York and walking up to the Empire State Building under construction and knocking on the door and asking if you could go up—that’s what it was like. It was pretty limitless, if you could deal with it, if you could get past security, you could be on top of the Jin Mao! I spent the whole day up there—the workers weren’t roped in, I wasn’t either. Ten years later it took me a year to get access to the top of the World Financial Center. You can measure the change with the red tape. [Those days] you get a call, fly somewhere, evade detention, make the deadline. I used to take unprocessed film to Hongqiao Airport and find someone to take it to Hong Kong. What themes did you cover, and do European and American editors look for different things? It is very different how China is reported. The American sensibility versus, let’s say, the French. The French have a different understanding, a more romanticized view, and they probably know more about China; they had a different engagement with China, and they have a different pace and expectations. America is much more about mass consumption, exporting the capitalist model. And traditionally there has always been a greater interest in photo-reportage in Europe. How was that reflected in your assignments? The difference in assignments came down to whether you were working with a locally-based journalist or had an assignment from somebody in Europe or the States. Editors from outside China would often say the picture had to have “Chinese characteristics,” i.e. show China in a very obvious way. They’d ask, can you get a picture of Pudong, for example, with traditional Chinese architecture? No, it’s practically impossible! And, what’s the point? You want to be ahead of the curve, but how? Where is the edge, where is the fringe, and how do we get there? I’m not interested in telling the same stories over and over. Do you need an affinity for, and an understanding of, the culture to be on that leading edge? If you are very perceptive and connected, you can find things anywhere. It really comes down to time, especially these days in journalism and news, everything is just so immediate. But if you want to tell a story you need to know how to read and speak Chinese, otherwise you are not getting the Chinese perspective and are very limited. When you start searching on the Internet in Chinese, for example, it’s like a whole new world. And understanding the nuances of the language is huge… I am just amazed by the young foreigners now who go to live in China and can speak very good Chinese. That says something about the change. And one recent thing that has struck me is that Chinese are living in their own clothes now. It isn’t just Gucci, Prada—now they are more secure with themselves and who they are and their own identity. Do you ever consider the overall impact of photojournalism on how China is perceived in the outside world? Looking back on it, I was basically a propaganda photographer. My photography played a role in promoting China’s grand plan of constructing Pudong as an icon of “new China.” Pictures were needed to propagate that “new China” message and, knowingly or not, I was the photographer supplying that demand. That description may even be fitting of many of the pictures made elsewhere that I supplied to illustrate China’s economic growth. I always did try to make real pictures, but those were not always chosen for publication. The reason may have been that they required too much explanation, they weren’t a quick read. So I was operating in a place between the message that the Chinese government wanted to send and the photography used as illustration that the Western press was willing to publish, often from a biased or limited point of view. What kind of affect did being a foreigner have on your experience? Opinions and points of view are often influenced by direct experience. That’s why I tried to suggest to the Foreign Affairs folks (at the bureau in charge of foreign journalists), if you try to control the press they are going to feel they have to go around you. Why not let it happen—don’t be too paranoid. The odds are there will be little that will have that big a negative effect. But, once you are accredited, you are flagged. I went to photograph the AIDS epidemic in Henan around 2000. I landed in Zhengzhou [the provincial capital], I’m coming down the escalator and there’s a guy with a video camera right on me. I got in a taxi, he pulled up behind us, I told the taxi to circle back to the airport. We lost them, but then we are driving down the highway and this car’s behind us, the taxi driver asks, “Are you guys in trouble?” He was sweating. Finally, we dumped them and went to a different hotel, got up really early, got a different taxi, and there’s this car behind us—the same one. So I said forget it, went back to airport. Tried again by train. We were followed again. This sort of thing happened often. China is probably one of the most difficult places in the world for a journalist to work. After being there so long and working in these conditions, you go to a different country like Mexico, where I lived for two years. That’s difficult because the drug dealers may have it out for journalists reporting their story, but it’s not as difficult as China, especially after 1989 and in the run-up to the Beijing Olympics. What’s your plan for your photo archive? At some point a photographer will have to consider how to archive their work. A collection on a single topic, like China, has value. I have about 150,000 color images made in China from 1994, up until now. Some 130,000 of these are color transparencies I shot up to 2011, before I switched to digital. I feel that my China work belongs in China. That is where it can be most appreciated and get the most use in the years to come. So my idea is either to sell the archive by auction or find somebody who can purchase it and gift it to an institution that has the environment to provide for archival longevity and allow access for academic research and historical study. That could be a museum, or a university. And then, depending on the sale, I hope to launch a photography foundation to support Chinese photographers’ work on China and any China-related subject. I think there is a strong need for a that. With that I could look forward to being involved with photography about China in the next 20 years.